Winter Skin based on Dejawolfs template. One with german decals, one blanko. You need the spanishdecals.dds file to activate any new decals. 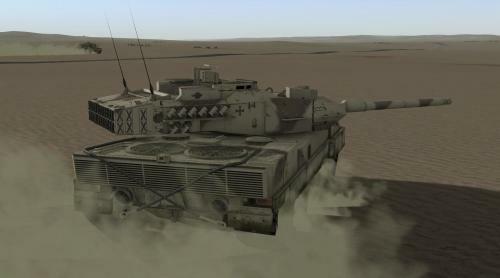 Desert Skin for Leo2E based 99% on Dejawolfs template, one Bundeswehr one blanko. 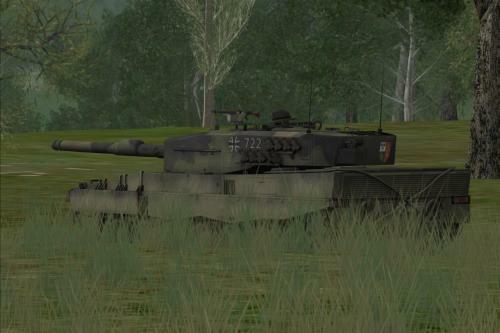 Copy leopardo2E.dds and spanishdecals.dds into your mods folder desert + de (or your country). You need the spanishdecals.dds to activate any new decals. 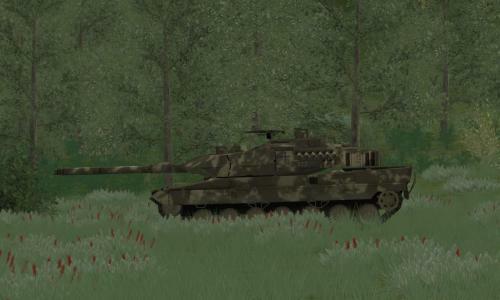 Woodland Skin for Leo2E, one with german decals, one blanko. You Need the spanishdecals.dds to activate any new decals. 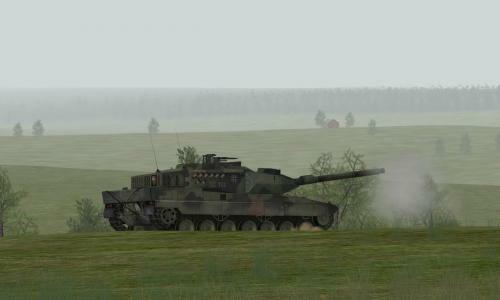 Version 1.1 with changed green colour (more german). Problem solved !! Thanks a lot, both answers accepted POTZBLITZ...perfect service! 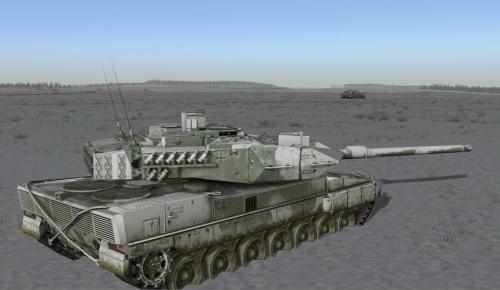 I only have one version of vehicles like EagleIV and MAN SX45, no weapons, no gunner, no control monitor, when creating a new scenery. The outside view (F8) don't show any weapons. 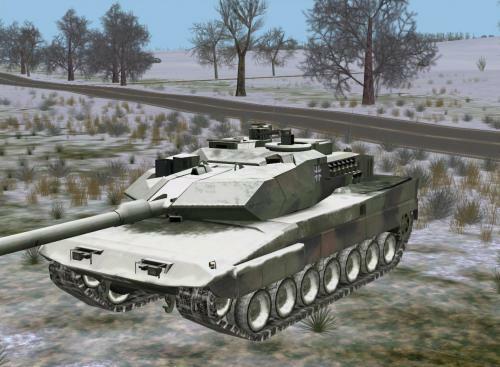 By the downloaded "Tank Museum" made by Skybird, everything is working fine, two versions of Eagle IV, two MAN SX45 trucks. Piranha IIIC is the same problem, has no weapons, gunner, control monitor. ??? How to install new terrains? where do I have to install new terrain files (.ter) ? In mod folder 'terrains' it doesn't work. Who can help? A Leopard must be a Leopard. One file with german decals, one roof file, one blanko file without any decals and markings. Have fun ! A cammo....like the shadow of the trees, difficult to identify the silhouette. 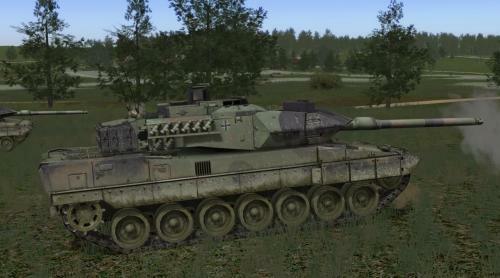 One dds file with full german markings, one roof file, one blanko file without any markings and decals. 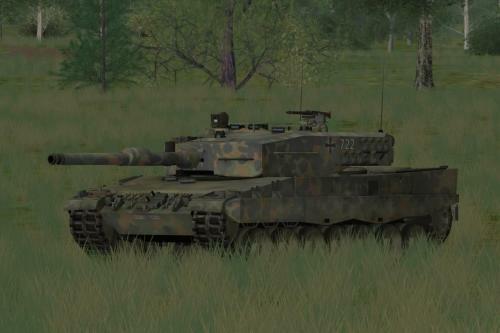 Leo2A6 Bundeswehr based on the original new winterskin 2.460. 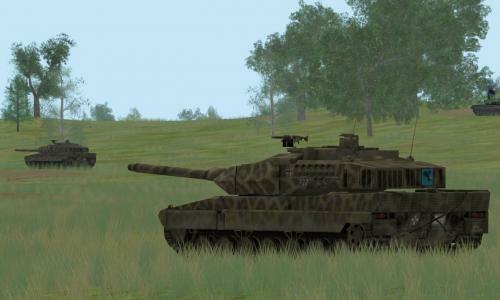 Leo2A6 based on a Leo2A5 skin made by Hawk (?). Update 2.1 in high resolution (2048) with some improvements and a blanko skin without any markings and decals.